This other day, I received a package and was pleasantly surprised to see the contents. There was this cute basket with a dry coconut, 4 shades of Godrej Nupur hair colour and a Godrej powerbank! My day was made! I really needed it all - Safe to use hair colour to hide my greys, A powerful portable charger to match with my smartphone use and coconut to make chutney for dinner. Hahahahaha..
A little about the product - Godrej Nupur Coconut Henna Crème is a crème based hair colour enriched with the conditioning of henna and nourishment of coconut oil. 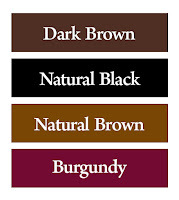 This product is available in 4 natural looking beautiful shades – Natural Black, Dark Brown, Natural Brown, and Burgundy. Godrej recommends performing the Skin Hypersensitivity Test 48 hours before every application of this product. 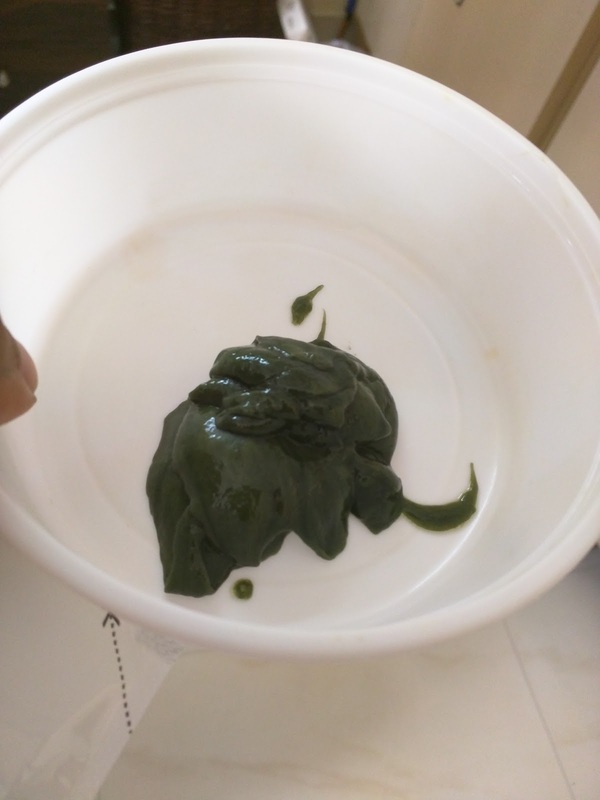 Instructions about this test are mentioned on the product. The coming weekend, I was all set to colour my hair. I chose Dark Brown because Natural Black is how my hair naturally are, and I wanted something different. But was not too sure about being bold enough to go for Natural Brown or Burgundy. 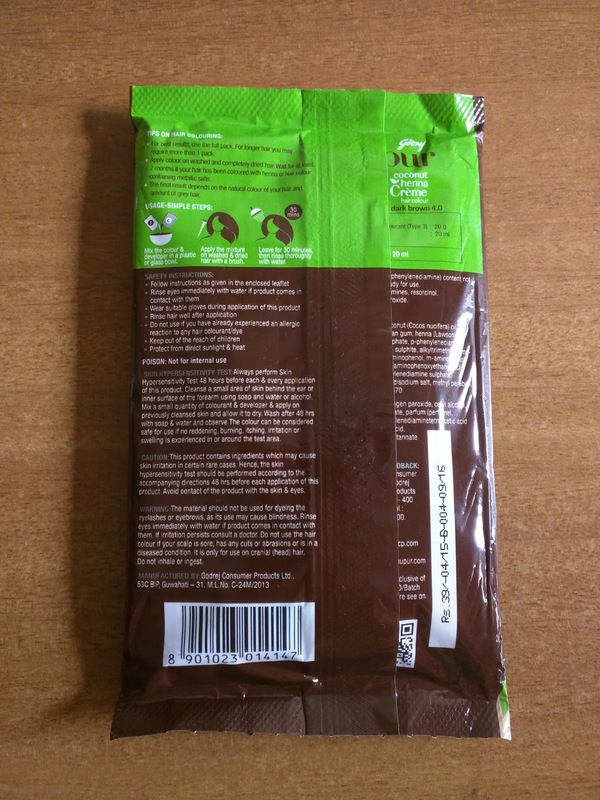 One important note - Your hair length will decide if you need one packet or two packets of the hair colour. 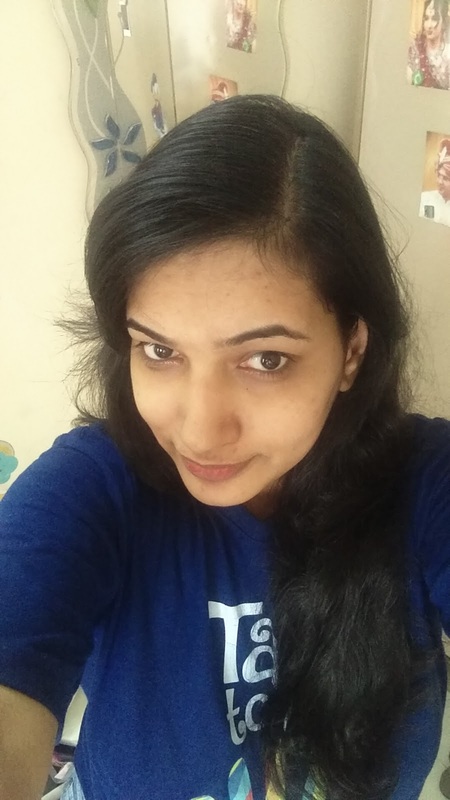 If you have short - shoulder length hair then one is enough, if below the shoulders or almost till the back you will definitely need two packets for the results to show. 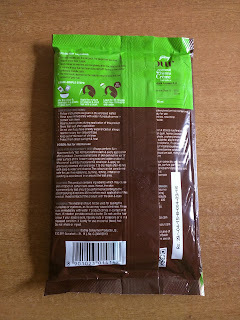 The contents are a sachet of colour and developer which are to be mixed together and applied on hair for 30 minutes. My hair before the application. 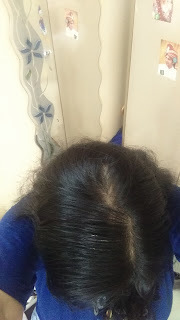 You can see a few visible grey strands. Sigh, I am growing old. 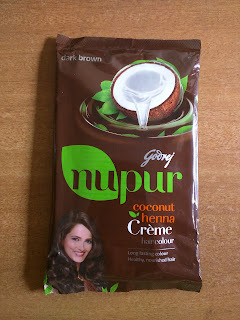 The coconut henna creme looks like this, very similar to the normal henna colour but a creamier version of the same. 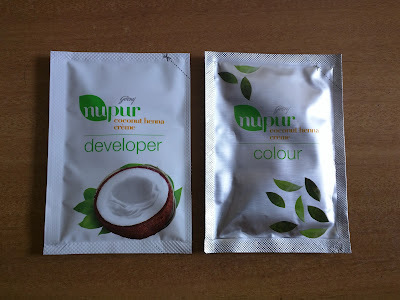 Mixed with the developer it doesn't have the typical henna smell though, instead it smells of coconut. 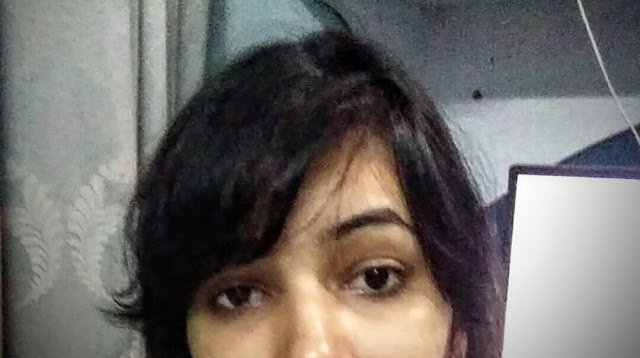 Sharing this close up because only this way you will be able to make out the visible dark brown tint in my hair. I managed to take care of most of the grey hair. Pros - A more nourishing and safe way to colour the hair as compared to others. Henna & Coconut are herbal hair care methods used since centuries. It is priced at Rs.39 which is a steal, frankly speaking. It is easy to use, though as a suggestion, I wish it came with a pair of disposable gloves and applicator brush, even if that meant it costs Rs. 60 or so. Also, because of it's natural ingredients, it does not leave your hair dry or brittle like many other hair colours do, your hair is soft and silky even afterwards. Cons - For me, because I used only one sachet, I could see a brown hue when in bright light.. If you are using this product mainly to cover your grey hair, make sure you apply it at the roots generously, using more than one sachet for longer hair. Verdict - I'm not sure, but I think this is a revolutionary first of a kind product where the hair colour is based on Henna and Coconut being the main ingredients. 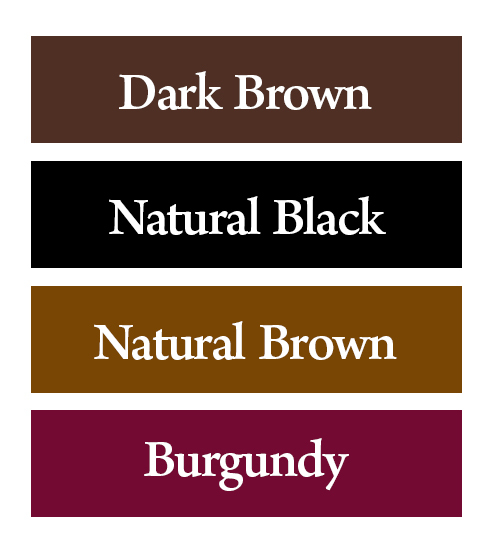 I am not scared to try the Burgundy now that I know it will just give a nice tint to my hair. Will definitely try after a couple of months. If you want to try a sample do comment and I'll send one to you! 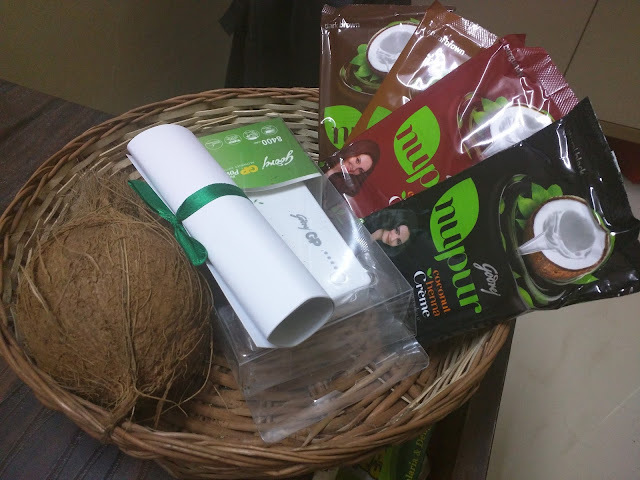 Do follow them on facebook to stay tuned for latest contests and offers - https://www.facebook.com/GodrejNupur.